What is Mueller Hinton Agar (MHA) ? Mueller Hinton Agar is used to isolate pathogenic species of Neisseria. It was developed in 1941 by Mueller and Hinton. Today, it is primarily used to test non-fastidious microorganisms using the Kirby-Bauer disk diffusion method. 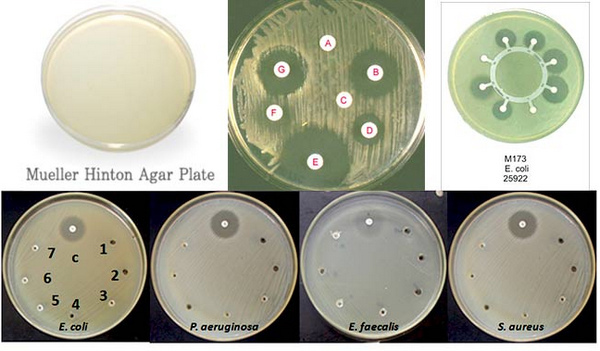 Image 1: Various organisms tested in a Mueller Hinton agar plate. Image 2: Visible growth colonies in a Mueller Hinton agar. Beef extract and acid hydrolysate of casein, which serves as the sources of nitrogen, amino acids, carbon, sulphur, and other important nutrients. Starch – It also contains starch, which absorbs toxic metabolites. Once the starch is hydrolyzed, it yields into dextrose and acts as an energy source. What are the uses of Mueller Hinton Agar? It aids in the cultivation of Neisseria. What makes Mueller Hinton Agar perfect for testing the susceptibility of antibiotic? Mueller Hinton Agar medium is non-selective and non-differential. It allows the growth of almost all types of organisms. The starch absorbs toxins released by the bacteria. Hence, the toxins won’t be able to affect the actions of antibiotics. It helps regulate the diffusion rate of antibiotics in the medium. Antibiotics are diffused evenly because Mueller Hinton agar is loose in characteristic. Proper diffusion is a must as it results in a true inhibition zone. It is low level of sulfonamide, tetracycline inhibitors, and trimethoprim. 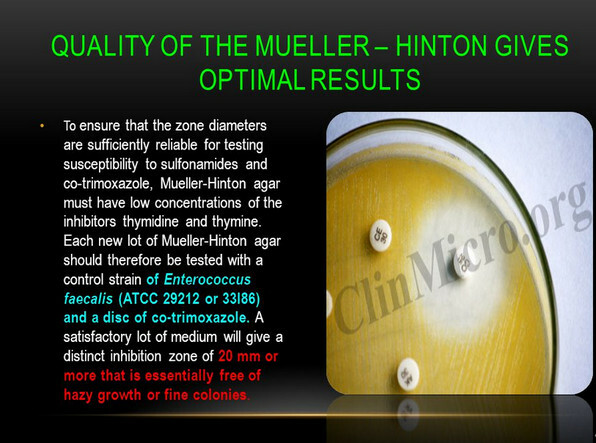 Mueller Hinton Agar allows the batch to batch reproducibility for testing susceptibility. 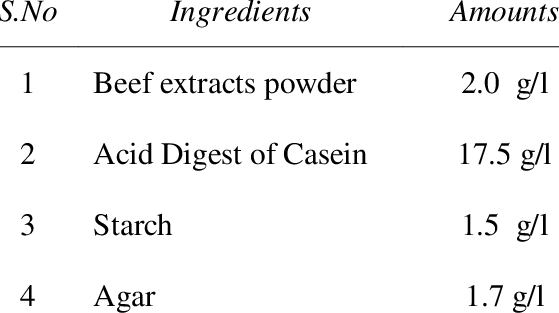 Image 3:The ingredients used in the preparation of Mueller Hinton Agar. How to prepare Mueller Hinton Agar? A 38mg of the medium should be suspended in a liter of water (distilled water). Bring to heat and let it boil for a minute; just enough for the medium to be dissolved completely. Autoclave for 15 minutes at the desired temperature (121 degree Celsius). Let it cool down at room temperature. Once the agar has cool down, pour into the sterile petri dish. Make sure that the agar is in uniform depth. Let it cool down at room temperature. The final pH level should be 7.3 ± 0.1 at 25ºC. Image 4: Quality control is a must when performing susceptibility testing using Mueller Hinton agar. Too shallow plates would lead to a false positive result because the antimicrobial compound will be diffused even more than expected. As a result, it will create a large zone of inhibition. On the other hand, a too deep plate will result in a false resistant reading. The pH level is important too. A pH level of below 7.2 could lead to some type of drugs to lose their potency. Some may even have excessive activity. An opposite result will occur if the pH level is higher than 7.4. Escherichia coli – there should be good growth. The color of the growth colonies should be pale straw. 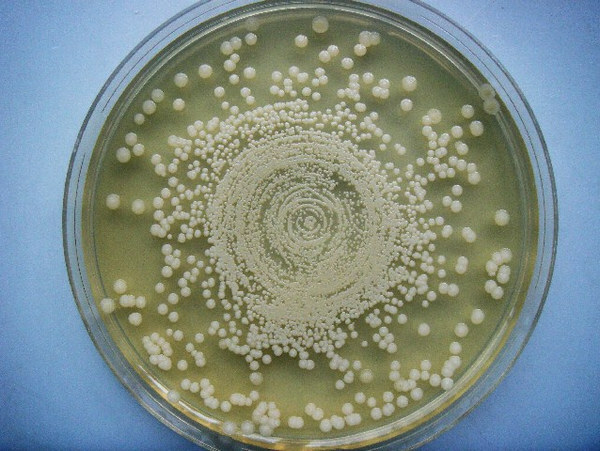 Staphylococcus aureus – There should be good growth and the color of colonies is cream. There is no significant change in the un-inoculated medium.